Oxford, known best for its 'dreaming spires' and university, is a lively, bustling, cosmopolitan city well worth a visit if you are in the UK. Oxford, known best for its 'dreaming spires' and university, is a lively, bustling, cosmopolitan city well worth a visit if you are in the UK. If you arrive by car, you would be well advised to park in one of the three park-and-ride car parks. Once in the city, get a map from the Tourist Information Office located in The Broad near The Oxford Story, or just pick up one of the 'Hop on - Hop Off' leaflets for the City-Sightseeing Tour by double-decker, part-open-top buses. You can pick these up at special stops all over Oxford. It's best to take the tour early in the morning so you can take the full circuit in an hour and then have the option to make use of the service to hop-on and hop-off to get you round the city. Personally, however, I preferred to walk once the bus tour was under my belt. They give you headphones and you plug them into a socket near your seat and then select your language and volume level. A really detailed commentary is perfectly synchronized with the location of the bus. If you get the chance, sit in a window seat, for the lead is a little on the short side and I found this a pop-in, pop-out experience when sitting in the outer seat: with the audio cut at the most critical moments! There are also walking tours to consider, where you will benefit from local knowledge. I would always recommend these. 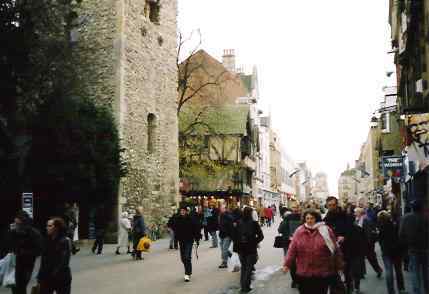 To get an overview before you begin any walking, however, try climbing up the 99 steps of the Carfax Tower in the city centre for a great view. The tower is all that is left of what was once St. Martin's Church when, sadly, due to mounting traffic problems at the end of the 19th century (sic! ), road-widening lead to the demolition of the main body of the church. 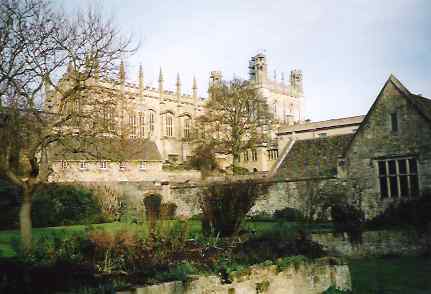 Although Oxford seems a peaceful enough place today, there has traditionally been a rocky relationship between its residents and the University of Oxford - not least due to the fact that the scholars had legal precedence over the town. 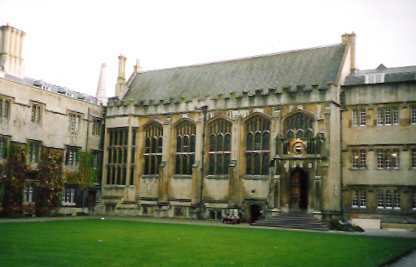 Until the 20th century the Chancellor of the University had the legal right to trial over townsfolk and it was not until 1974 that the university lost the right to place its own representatives on the Oxford City Council. Some believe the University was founded by the Saxon King of Wessex, Alfred the Great (871-899), due to his liking of scholarly pursuits, but no sound evidence supports this. However, it is known that during the late 11th or early 12th century Oxford became a centre of learning for clerics from which a school or university could have evolved. The 'town and gown' of Oxford have experienced a rather violent past, with one of the most infamous outbreaks of rioting happening on St. Scholastrica's Day on February 10th, 1354, when an argument over indifferent wine served at the Swyndlestock Tavern near the Carfax Tower escalated out of control with wild student fighting. The townsfolk came to the defence of the innkeeper against the students and three days of fighting followed with many students being killed and colleges ransacked. Afterwards, the city was made to pay for college repairs and both the Mayor of Oxford and Burgesses were forced to swear allegiance to the University's Chancellor every year in a special ceremony which included paying token damages. This occasion continued well into the Victorian era. Indeed, it was earlier general unrest that led to a scholarly split and the consequent foundation of a rival university at Cambridge. In 1209 scholars and masters escaping troubles between the university and townsfolk in Oxford set up their new camp in Cambridge. By 1226 the Cambridge scholars had organized regular courses of study and named a Chancellor to lead them. The first great boost to the formation of a university came from Henry III, who gave the scholars his support as early as 1231. Henry decreed that only students studying under a recognized Master were allowed to remain in Cambridge. 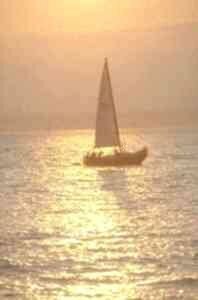 The two universities have been rivals over the centuries, most notably in their annual Boat Race. All in good fun, of course. Oxford University comprises many different colleges and university buildings, most of which are within easy walking distance of each other. Although, as in Cambridge, students often opt for the bicycle rather than leather (or 'trainer', today). Bicycles are everywhere, so watch your step! The once smart students sporting their university scarves are, in the main, replaced today by the jeans-clad generation sporting their mobile phones. But that does not mean there is not still a sense of grandeur, a spattering of the 'Oxford accent', a decency that lifts the average undergraduate above the rabble. I cannot envisage them attacking a landlord for an indifferent pint today - or of the townsfolk ransacking the colleges in response. A unique thing about the Oxford University approach is that they have three eight-week terms each year during which students undergo a one-to-one with their tutors each week. During this session they have to be convincing that they know what they are about and prepared to argue their case well. This harks back to the days when, instead of sitting an exam, debating skills won the day and a good argument about how many angels could dance on the head of a pin could merited high achievement. Walk around the town and you will see all the grand university buildings. Don't miss the Bodleian Library, which has its own shop. This library has, by law, a free copy of every book published in the UK, and these are stored in numerous underground rooms spanning several floors beneath the building and adjacent road. Amazingly, students can order books from libraries around the city and have them transported to them, within 6 hours, by a dedicated underground transport system. It's a system that puts new meaning to the phrase bookworm! Nearby is the Radcliffe Camera which, although not open to the public, is well worth seeing from the outside. If you want something more imposing, try Christ Church; follow St. Aldates through towards Abingdon Road. Some university buildings are open to the public insofar as you can enter through their imposing arches, see their inner quadrangle, perhaps visit their chapel or walk their cloisters. One such case is Exeter on Turl Street, just off the High Street, and you cannot miss its imposing grey spire as you enter the street; I particularly like its fine chapel. 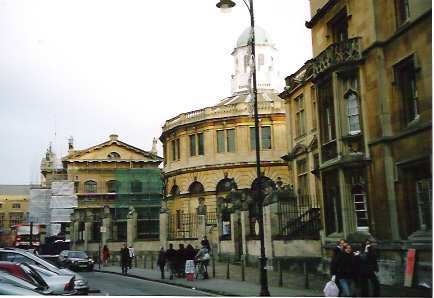 Nearby, in Broad Street, is the Sheldonian Theatre, a venue for official university functions as well as a variety of concerts (tickets available from The Oxford Playhouse in Beaumont Street). The University also owns the Ashmolean Museum on Beaumont Street (opposite The Playhouse), Britain's oldest public museum. 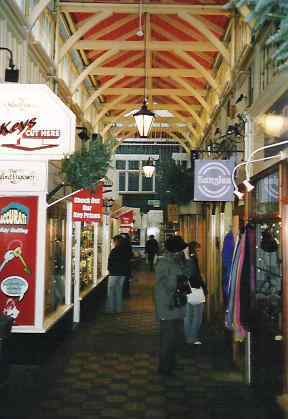 Visit the Covered Market off the High Street and you practically walk back in time. Here you will find places to eat, places to shop from walk-in shops to narrow shop-through-the-window shops. Here are old-fashioned butchers and greengrocers, sausages, pies, vegetables, gifts, all manner of interesting wares. In the summer you might like to try a punt on the river but, be warned, it's not as easy as an experienced hand makes it look. If your pole gets stuck in the mud you have two options: stay with the boat and loose your pole; stay with the pole and lose your boat. I know which I would prefer! And even if that doesn't happen, you'd be surprised how difficult it is to steer a punt since each push gives not only forward but usually significant side motion as well. It is all good entertainment, though - especially for the spectators. The last time I tried it I steered the punt into a canopy of low hanging trees much to the amusement of some girls picnicking on the bank. I had the last laugh a moment later, however, when they were attacked by a hungry bee and got in their own flap. There is always an inevitable comparison to be drawn between the rival university towns of Oxford and Cambridge. Oxford is considerably larger and comes across as a city where Cambridge seems rather more 'cosy'. Cambridge, perhaps, has a certain charm, whereas Oxford has a certain air. Academically I would not dare be drawn. Aesthetically, there is little to choose. But for things to do and see, I reckon that Oxford wins gowns down.